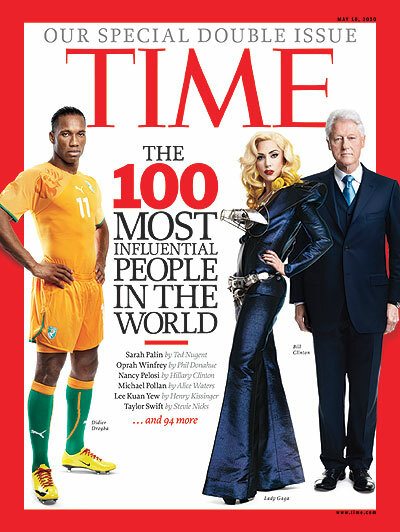 Putting together the most-influential list is easy: The President! Oprah! The President of someplace else! A person who appears on Oprah! And besides being easy journalistic lifting, it's also the best thing you can do for your career: you get to call powerful people and tell them how very powerful you think they are. Not only do you increase your chances of Steve Jobs' calling you back for a quote for your next article, but with journalism going the way it is, it's pretty comforting to know you can e-mail your résumé directly to Han Han. But making a least-influential list, that's a fool's task  one that only a true journalist, a brave journalist, a handsome journalist would venture. Even the truest, bravest, handsomest journalist, however, has some trouble putting such a list together. First of all, the list I made (which you can read in full at time.com/leastinfluential) does not actually consist of the least influential people in the world. Those would be infants, people in comas and North Koreans who aren't Kim Jong Il. And it's not a list of those with the most negative influence: the underwear bomber, that tattooed chick who messed up Sandra Bullock's marriage, Jay Leno. My list is, technically, the Least Influential People Who Used to or Ought to Have Influence. Which also rules out those who simply had a bad year: Tiger Woods is still immensely influential, only now his influence lies in preventing men from texting their mistresses. None of Tiger's mistresses are on my list either, since they influenced fame-seeking sluts all over to make sure their famous boyfriends text them. So it was very difficult to fill up a list of 100 uninfluential people. For help, I called news anchor Rick Sanchez, who hosts Rick's List on CNN from 3 to 5 p.m. E.T. I figured that when you're trying to book guests in the afternoon on CNN, you get to talk to some pretty uninfluential people. "Don't shy away from easy pickings," Sanchez advised. "When someone says something dumb, Joel, it's your job to report it." Sanchez airs a segment called "The List You Don't Want to Be On," from which he gave me some names. "A lot of times these guys are famous for 35 seconds," Sanchez said. "I'd never heard of the president of Toyota until he was on the list. I can't even remember his name now." That man's name, by the way, is Toyoda. When someone says something dumb, it is my job to report it. As Sanchez suggested, I tried to stay away from his first choice in guests  people involved in American politics  and instead focused on publicity hounds such as Heidi Montag, Balloon Boy's mom, the H1N1 virus, Google Buzz and Senator Roland Burris. To give the list structure, I broke it into four categories, just as TIME does for its most-influential list. Only I divided mine into Losers, Flameouts, Morons and Slimy Bastards. The Slimy Bastards section was like the Harvard of the uninfluential, with not nearly enough slots for all the deserving candidates. Sadly, I had to scratch off Rod Blagojevich, who I know is eager to get on any list he can, in order to fit Levi Johnston, the Kato Kaelin of American politics. Making the Flameouts section, however, was as easy as winning a Rhodes scholarship if you were born in the South: I scrounged to fill it with George Clooney's ex-girlfriend, Carson Daly, 2-D and Bo Obama. Seriously, after all that hype about what breed to pick, the First Dog hasn't written even one book yet. I leave it to you and the Pulitzer committee to decide which list is better, mine or the one that is taking up 800 pages of this magazine. I will just point out that unlike the most-influential list, which is clogged with foreign names you've never heard of (seriously, "Han Han"? ), mine has only 19 foreigners, and that's including Mayor McCheese, who might actually live in the U.S. In fact, there would be only 16 foreigners if I hadn't gotten lost in a Wikipedia hole about the Icelandic financial crisis. And keep in mind that six of the uninfluential have posed completely naked, while the closest the most-influential list gets is Lady Gaga and the tight, transparent, low-cut white T-shirts of Simon Cowell. Also, it should be noted that, percentage-wise, my list is way higher in reptilian humanoids. TIME should really be throwing a big party for my list instead of its list. I'm sure Han Han is a lot of fun, but if you mix alcohol, deposed world leaders, professional-wrestling referees, Tila Tequila, Paula Abdul, Tom from MySpace and the entire nation of Greece, you're going to need a lot of cops to break it up.